Posted on 04/18/2015, 10:37 PM, by Black Cat, under Old School Wrestling Podcast. This week Dre and the Black Cat dust off an old episode about Bash at the Beach 98 with Rodman and Malone that they recorded over two years ago but kept in the back of their pocket in case of emergency. Time went by and they never used it, so they decided to release it this week in honor of their upcoming visit to the 2015 C2E2 convention in Chicago because of a tremendous story in the second half about Dre’s visit with wrestling superstar Virgil at the 2013 C2E2. Please support the Old School Wrestling Podcast by visiting oldschoolwrestlingpodcast.com where you can find links to all of our great products. We now offer all of our box sets and bonus episodes from all three seasons on our premium digital download site. Thanks for listening and we’ll see you…..at the matches! 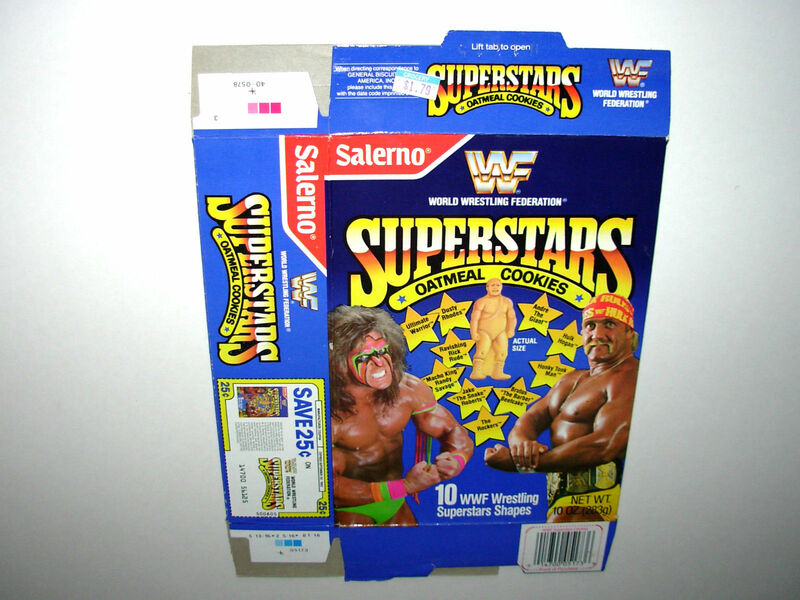 The only wrestling themed food that I recall ever being allowed to have were the WWF Superstar cookies. Little oatmeal cookies shaped like wrestlers. I did get one DDP shirt and still wear it to this day. Perhaps the best Michael Buffer intro was when he introduced Scott Steiner. “With his favorite freak, Midajah”. Also, Buffer screwing up the title match where Flair beat Hogan by countout and declared Flair the once again World Heavyweight Champion, before correcting himself and saying that Flair won by DQ and the title cannot change hands on a DQ. I also could swear that one time when he was announcing a WCW PPV or Clash main event, that he had a retainer on, or some sort of braces or mouth gear. In Buffer’s defense for announcing Flair as champ after winning by count out, it’s very possible he could have been told to do that. SWERVE! Or he went rogue and really wanted Flair to be champ. So he figured if he announced Flair as the new champ, it would be so. Because he’s BUFF, he’s the Stuff, and the girls…oh wait, wrong Buff. Great show as always. Can’t say the same for Michael Buffer’s announcing. I get the sense that if he had not been given the cue cards his announcing would have degenerated into something resembling that SNL sketch where a morning talk show’s teleprompter busted and the hosts essentially degenerated into cannibalism within five minutes. To think Gary Capetta was let go from WCW to make way for the Buffer budget. And that’s what we’re gonna do to you Monday night Moondogs…. The post arrives, a middle aged man looks around for neighbours, grabs the parcel wrapped in plain brown paper. He quickly shuts the door and hurriedly runs to his room. Within minutes he is semi naked and eagerly about to indulge in his fantasy. Soon the brown paper joins most of his clothes on the bedroom floor. He closes his eyes, takes a deep breath. He turns to the full length mirror to admire himself. Standing semi naked, proudly holding his prize. A WWF replica belt. In my opinion, these belts should carry an under 12’s only warning! The idea of a grown man stood looking at himself with the belt held above his head or even more worrying draped over his shoulder cutting a promo is very disturbing. In the same way you have to lick your lips when eating a sugared donut, maybe if a replica belt is in your hands you have to pose with it? It’s all very concerning. Anyway, I’ve got to go, I’m expecting a delivery! PS, ever wondered why Virgil didn’t say a lot in the WWF? I think we now know!